Want to grow your team? Well, it all starts when you bring up your opportunity to a prospect. Here’s how to present your business in the MOST Duplicatable Way. 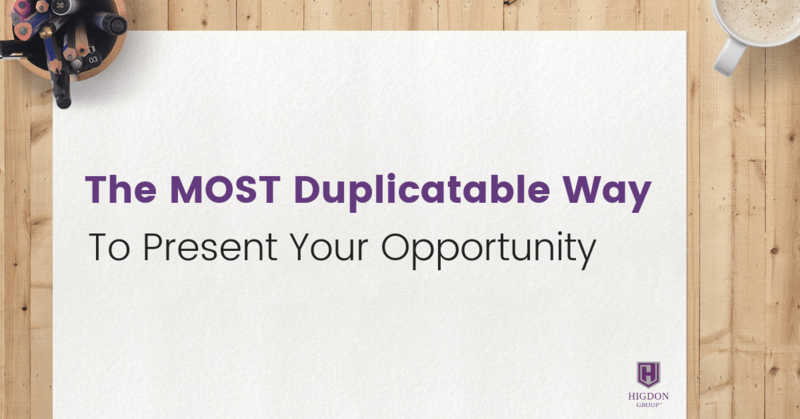 How’s the best way to present the opportunity, the most duplicatable way? First of all, all prospecting, I don’t care if it’s online, offline, face to face, Hologram, Instagram, exchange a gram, telegram. Doesn’t matter. However you’re prospecting. See if they’re open, give them an out. See if they’re open, give them an out. Give them an escape plan. Although amateurs would be scared to give an escape plan because they’ll say things that go quite the opposite direction. Giving them an out is a very powerful way. It actually adds power to you. Doesn’t take away. It’s when you try to close them and try to make it, like it’s your decision that they should do it. That’s when you lose power. That’s when you create resistance. So, it’s not good. Let’s say that they’re open. Now, what’s the least duplicatable way? I’m gonna give you two scenarios. You position yourself as special, credible, an authority figure, charismatic, persuasive, and you go to people and you say, “Hey, I’m doing this thing. You should totally do it. Come on, let’s go. Give me a credit card,” and you don’t equip them with a way to comprehend how they can do the business. Let’s say you sign up your doctor, and if you sign up your doctor and you don’t train them to be duplicatable and you don’t train them to use resources, you just recruit them and you’re all excited. You’re like, “Woo. I got my doctor, man.” And so the doctor says, “Okay, well I can carry this stuff in my office.” When people come in they ask about the products. If there’s no tools, it’s just persuasion and authority. It’s just, “I’m super special and you should listen to me,” then you’re NOT going to have duplication. Now, if that doctor said, “Hey, you know what? That’s a great question. There’s actually a short video that will tell you about the deal and tell you all about it. I’m happy to have you watch the video if you would like,” that’s actually duplicatable. If you’re setting yourself up as special, credible, authority figure and you just want to persuade people to do your deal without using any kind of tools, you’re not very duplicatable. You’re not. And so, if you want more duplication stop trying to impress people. Stop positioning yourself as special. All the things that you’re using to make you special, incredible and stand out are the things that people are using in their mind as reasons they can’t do what you can do. If you have people telling you, “Well, it’s easy for you to say,” or, “I can’t do what you can do.” I’m telling you right now, you are positioning yourself as special, credible, your position yourself as some kind of higher authority or something like that. There are ways to brand where you’re not doing that, and we teach that kind of stuff inside of Rank Makers. The more knowledgeable, the more specialized knowledge that you display because you want to be super smart and gotta you got to give all the information to your people, wrong. You’ll run across people who are very detail oriented. You know what you do with them? You point them to the website, point them to other videos. Don’t explain it because if you explain it, they think they need to explain it and very few people want to learn all that stuff. They want to make money. They want to get benefits from the product or service. And, they want to have fun. You don’t want to memorize a whole bunch of stuff, and if they do memorize a bunch of stuff their duplication will be harmed.